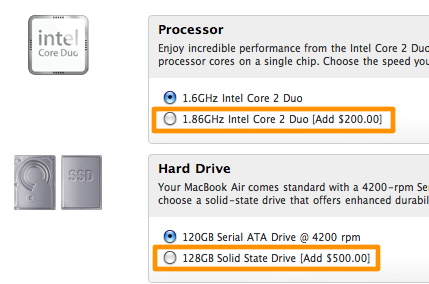 So it’s an extra £500 to upgrade the processor from 1.6GHz to 1.86GHz and 120GB SATA drive to 128GB SSD drive. However, if you click to configure the cheaper £1,299 machine and take it to the same spec as the £1,799 machine it actually works out CHEAPER! 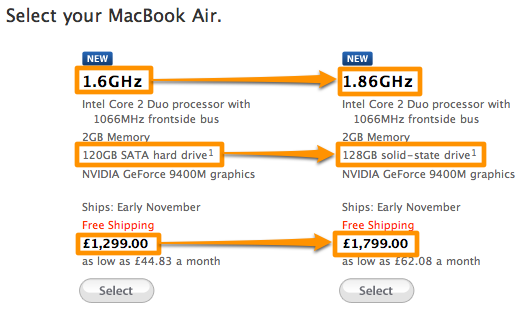 You can see from the screen shot above that to upgrade from the 1.6GhHz to the 1.86GHz costs an additional £140. 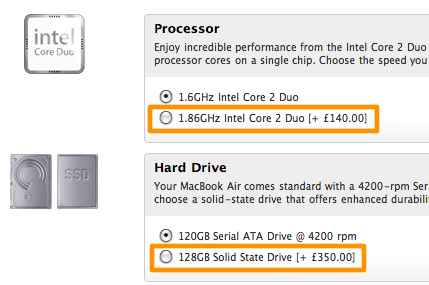 To upgrade from the 120GB SATA to the 128GB SSD costs an additional £350. So when you add them both (£140+£350) you pay an extra £490 which is £10 cheaper than buying the pre-configured machine with exactly the same specifiation. 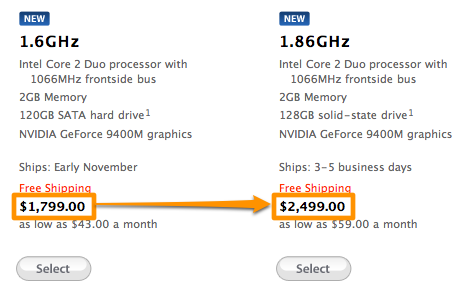 You end up paying $200 for the processor upgrade and $500 for the upgrade to SSD so a total of $700, the same as the higher spec pre-configured model. Previous PostPrevious Unable to login to Facebook using Safari? Turn off Private Browsing!